America Makes 250,000.00 139 2016 Job training/manufacturing https://www.google.org/our-work/economic-opportunity/ -- Grant is for job-ready skills training in advanced manufacturing techniques for former military veterans. Affected countries: United States. BSS (Making a World Together) 228,869.00 154 2016 Financing/credit rating system https://www.google.org/our-work/economic-opportunity/ -- Alternative credit rating system based on social signals. Affected countries: South Korea. Czechitas 257,700.00 137 2016 Job training/digital skills and data science https://www.google.org/our-work/economic-opportunity/ -- Digital skills and data science trainings for women in the Czech Republic. Affected countries: Czech Republic. Digitale-Helden gemeinnützige GmbH 281,400.00 135 2016 Digital literacy/online safety training https://www.google.org/our-work/economic-opportunity/ -- Peer to peer training for digital literacy / online safety. Affected countries: Germany. Root Impact 228,869.00 154 2016 Career counseling https://www.google.org/our-work/economic-opportunity/ -- Program to connect high potential youth with social impact career opportunities. Affected countries: South Korea. Themis 201,995.00 165 2016 Worker rights https://www.google.org/our-work/economic-opportunity/ -- Grant for app to inform and educate domestic workers about their rights. Measures for Justice 1,500,000.00 33 2016 Criminal justice reform/United States https://www.google.org/our-work/inclusion/measures-justice/ -- Grantee is a national nonprofit with the goal of making information on the working of their local justice system to anybody in the United States. The grant helps the grantee expand throughout the United States, with an inital focus on California. Googler volunteers are also advising on data processing for the database. Affected countries: United States; affected states: California. Equal Justice Initiative 1,000,000.00 49 2016 Criminal justice reform/United States https://www.google.org/our-work/inclusion/equal-justice-initiative/ -- Grantee is committed to ending mass incarceration and excessive punishment in the United States, to challenging racial and economic injustice, and to protecting basic human rights for the most vulnerable people in American society. Grant supports two projects: a museum examining African American history (called "From Enslavement to Mass Incarceration") and a national memorial to lynching victims (called the "Memorial to Peace and Justice"). Affected countries: United States. Center for Policing Equity 5,000,000.00 5 2016 Criminal justice reform/United States/public safety/racial profiling https://www.google.org/our-work/inclusion/center-policing-equity/ -- Grantee grated the National Justice Database (NJD) in 2013, claimed to be the first database tracking national statistics on police behavior, including stops and use of force. Affected countries: United States. Center for Youth Wellness 1,000,000.00 49 2016 Adverse childhood experiences https://www.google.org/our-work/inclusion/ -- Grant for expansion of the work on adverse childhood experiences ("ACEs") with Harlem Children’s Zone. Affected countries: United States; affected states: New York; affected cities: New York City. Code for America 500,000.00 96 2016 Criminal justice reform/United States/rehabilitation https://www.google.org/our-work/inclusion/ -- Grant to reduce incarceration among a local parolee population, help residents who have completed their sentences clear charges on their records, and help the chronically unemployed access necessary job training through the publicly funded workforce development system. Affected countries: United States. Geena Davis Institute 250,000.00 139 2016 Gender representation https://www.google.org/our-work/inclusion/ -- Grant to use technology-driven approaches to research gender portrayals and representation in media. Affected countries: United States. Impact Justice 1,000,000.00 49 2016 Criminal justice reform/United States https://www.google.org/our-work/inclusion/ -- Grant for work with 10 jurisdictions to build restorative justice diversion programs that will keep 1,900 youth, primarily youth of color, out of the juvenile justice system. Affected countries: United States. Instituto de Tecnologia e Sociedade 466,143.00 114 2016 Public policy platform https://www.google.org/our-work/inclusion/ -- Grant for online platform to debate and create public policy proposals and collect certified digital signatures. JustLeadershipUSA 650,000.00 86 2016 Criminal justice reform/United States https://www.google.org/our-work/inclusion/ -- Grant to transform the field of criminal justice reform by training a growing national network of formerly incarcerated leaders from across the country to lead reform efforts at the local, state, and national level, and provide fellows with devices to encourage connection and post-curriculum learning. Affected countries: United States. National Museum of African American History and Culture 1,300,000.00 39 2016 Museum https://www.google.org/our-work/inclusion/ -- With grant, Google.org would become a founding donor to the museum and support the creation of a 3D artifact wall to showcase artifacts not currently on display in the museum. Affected countries: United States. Silicon Valley De-Bug 500,000.00 96 2016 Participatory defense https://www.google.org/our-work/inclusion/ -- Grant to support the growth of participatory defense as a national practice by equipping 24 participatory defense hubs with devices to enable them to advance their work. Affected countries: United States. Southern Poverty Law Center 250,000.00 139 2016 Tolerance education https://www.google.org/our-work/inclusion/ -- Grant for funding a total redesign of the Teaching Tolerance website to ensure teachers can more easily access and integrate the content into their lessons. The funds will also support scaling of successful pilot curriculum aimed at teaching anti-bias, as well as high-quality teaching about slavery in the United States. Affected countries: United States. The Dream Corps #Cut50 250,000.00 139 2016 Criminal justice reform/United States/empathy https://www.google.org/our-work/inclusion/ -- Grant to use VR (allegedly) for the first time ever to create empathy on a massive scale for the millions of Americans behind bars. Affected countries: United States. Transparência Brasil 466,143.00 114 2016 Public finance https://www.google.org/our-work/inclusion/ -- Grant for citizen-driven tracking + monitoring of publicly funded projects (initial focus on schools). Affected countries: Brazil. W. Haywood Burns Institute 500,000.00 96 2016 Criminal justice reform/data quality https://www.google.org/our-work/inclusion/ -- Grant to improve the quality, accessibility and utility of justice system data in each of California’s 58 counties so that criminal justice reform organizations may make data-informed decisions that can advance a more effective and equitable justice system. Affected countries: United States; affected states: California. UNICEF 1,000,000.00 49 2016 Global health/Crisis response/Zika https://www.google.org/our-work/crisis-response/unicef-zika/ -- Google.org made a $1 million grant to support UNICEF’s efforts to create widespread awareness, reduce mosquito populations, and support the development of diagnostics and vaccines, and launched an employee donation campaign to support UNICEF and the Pan American Health Organization (PAHO). To bolster UNICEF’s existing prevention tactics Google.org’s Disaster Corps program dispatched a team of volunteer Google engineers, designers and data scientists to help build a platform that analyzes data such as weather or travel patterns in order to predict where the virus might hit next. Although the prototype is currently being applied to Zika, UNICEF intends to use it to study and fight future outbreaks of other diseases. Libraries without Borders 3,300,000.00 12 2016 Education/crisis response/refugee education https://www.google.org/our-work/crisis-response/libraries-without-borders/ -- Initial grant to expand Ideas Boxes to more countries, enabling access to content in refugee settings, rural areas, and underserved neighborhoods. Through Google.org funding, Libraries Without Borders has been able to deploy five Ideas Boxes for refugees in Greece (Lesvos, Athens, Malkasa), France (Grande-Synthe) and Germany (Düsseldorf). In 2017, Google.org will provide additional grant funding to support Libraries Without Borders with the installation of 6 Ideas Boxes in Europe and 8 Ideas Boxes in the African Great Lakes’ region. Khan Academy 5,000,000.00 5 2016 Education/online video education https://www.google.org/our-work/education/ -- Grant supports continued operation and growth of recipient, specifically investments in intelligent software, deep data analytics, and intuitive user interfaces. See https://www.google.org/our-work/education/khan-academy/ for more. Code.org 1,500,000.00 33 2016 Education/online coding education https://www.google.org/our-work/education/ -- Funding is to facilitate Code.org partnerships with teachers and school districts to promote the study of computer science. Although Code.org is globally accessible, the partnerships are in the United States. Google.org supports Code.org in many ways. For instance, the Google visual coding language, Blockly, underpins the Code.org educational content. Googlers also volunteer for in-person activities and provide project management skills. See https://www.google.org/our-work/education/code-org/ for more. Affected countries: United States. War Child Holland 2,500,000.00 19 2016 Education/tablet-based educational games/conflict zone education/refugee education https://www.google.org/our-work/education/war-child/ -- Recipient distributes tablet-based educational games that can be played in informal refugee learning centres without classrooms and teachers, and students can still learn. In addition to funding, Google is providing technical expertise of Googler volunteers to turn the approach of War Child Holland and partners into a scalable solution. Affected countries: Sudan|Lebanon|Jordan. Pratham 6,100,000.00 2 2016 Education/tablet-based education https://www.google.org/our-work/education/pratham/ -- This funding includes $3 million toward devices and an additional $3.1 million to support the Hybrid Learning Program, an initiative that empowers students to use self driven, tablet-based curricula to learn outside of the classroom. Affected countries: India. Clooney Foundation for Justice 1,000,000.00 49 2016 Education/refugee education https://www.google.org/our-work/education/clooney-foundation-justice/ -- Funding supports grantee efforts to provide education to out-of-school refugee children in Lebanon. Googler volunteers, working on the ground and remotely, will provide technical expertise. Affected countries: Lebanon. Nova Escola 5,100,000.00 4 2016 Education/digital education https://www.google.org/our-work/education/nova-escola/ -- Funding supports the creation of standards-aligned digital lessons, to deal with quality problems in the Brazil education system (it ranks low in international educational comparisons). Nova Escola is also supported by the Lemann Foundation, a leading Brazilian education organization. Goal is to reach 1 million teachers in the next 5 years. Affected countries: Brazil. RTI International 2,000,000.00 24 2016 Education/Teacher training https://www.google.org/our-work/education/rti-international/ -- Funding is for Tangerine:Tutor, an open-source software platform built by grantee by helping teacher coaches in low-resource environments provide targeted guidance for improved student learning. Google.org intends to help RTI update Tangerine:Tutor technical infrastructure and ope-source documentation to help with scaling up, and meeting five-year goal of supporting teachers who reach 4 million students. Affected countries: Kenya|Uganda|Nepal. Anita Borg Institute 300,000.00 131 2016 Education/computer science education/gender representation and race/ethnicity representation https://www.google.org/our-work/education/ -- Funding is for the BRAID initiative, a partnership with universities across the United States to increase the percentage of women and students of color majoring in computer science. Affected countries: United States. Calliope 555,000.00 91 2016 Education/micro-computers and related support https://www.google.org/our-work/education/ -- Grant is to distribute Calliope micro-computers and offer related support for schoolchildren in Germany. Affected countries: Germany. First Australia 693,810.00 84 2016 Education/robotics https://www.google.org/our-work/education/ -- Grant is to expand access to robotics clubs in underserved schools in Australia. Affected countries: Australia. Foundation for Learning Equality 5,000,000.00 5 2016 Education/offline access to online education https://www.google.org/our-work/education/learning-equality/ -- Grantee has a Kolibri platform that organizes content in a cloud based library, where it can be downloaded by teachers and learners and used offline, whether in schools, refugee camps, or orphanages. In addition to money, Google.org intends to work with grantee product team in areas such as UX/UI, content integration, and video compression technology. See http://ucsdnews.ucsd.edu/pressrelease/learning_equality_awarded_5m_through_google.org_global_education_commitment (2017-03-22) and https://techcrunch.com/2017/03/21/google-org-grants-50-million-to-nonprofits-striving-for-equal-access-in-education/ (2017-03-21) for more coverage of the grant. Affected countries: India|Latin America|Sub-Saharan Africa. Future Class Network 457,737.00 116 2016 Education/teacher information sharing and funding student projects https://www.google.org/our-work/education/ -- Grantee is a platform for supporting teacher information sharing and funding student projects. Affected countries: South Korea. Hispanic Foundation of Silicon Valley 250,000.00 139 2016 Education/parental support https://www.google.org/our-work/education/ -- Grant to help parents of Latino students become more knowledgeable about the local education system and how best to support their children, in order to increase the high school and college graduation rates of the children. Affected countries: United States; affected states: California; affected cities: Sunnvale|Mountain View. IAIS Fraunhofer 5,000,000.00 5 2016 Education/computer science education/offline training for primary and secondary school students https://www.google.org/our-work/education/ -- Grant to deliver offline STEM and coding trainings to 64,000 primary and secondary pupils and 1,500 teachers. Affected countries: Germany. JUMP SP 228,869.00 154 2016 Education/mentorship of disadvantaged students https://www.google.org/our-work/education/ -- Grant for mentoring program for disadvantaged youth in which mentors (university students) can earn scholarships and credits for college. Affected countries: South Korea. Kiron Open Higher Education gUG 281,400.00 135 2016 Education/online degrees for refugees https://www.google.org/our-work/education/ -- Affected countries: Germany. Like Lion 457,737.00 116 2016 Education/coding bootcamp https://www.google.org/our-work/education/ -- Grant for social impact-focused bootcamps. Affected countries: South Korea. Literacy Lab 250,000.00 139 2016 Education/digital books https://www.google.org/our-work/education/ -- Grantee gives kids access to digital books in multiple languages while creating a supportive online community for parents and caregivers. Affected countries: United States. Million Sparks Foundation 1,233,020.00 43 2016 Education/easy-to-use teaching tools and training modules https://www.google.org/our-work/education/million-sparks-foundation/ -- Grantee to improve the quality of education for low-income students in India by developing mobile technology that shares easy-to-use teaching tools and training modules aligned to local curriculum. Affected countries: India. Abdul Latif Jameel Poverty Action Lab 1,500,000.00 33 2016 Education/Educational research https://www.google.org/our-work/education/ -- Grant for research and education under the Post-Primary Education Initiative, particularly related to educational technology. Society for Black Engineers 300,000.00 131 2016 Education/computer science education https://www.google.org/our-work/education/ -- Grant for Code Success, a comprehensive program that increases graduation rates for African-American college students interested in and pursuing Computer Science degrees. Affected countries: United States. Spark 100,000.00 171 2016 Education/school success https://www.google.org/our-work/education/ -- Grantee to inspire 7th, 8th and 9th grade students to succeed in high school and beyond by connecting them with mentors in leading workplaces and supporting their academic journey with skill-building and resources. Affected countries: United States. The Australian Literacy and Numeracy Foundation 192,109.00 166 2016 Education/language preservation https://www.google.org/our-work/education/ -- Grantee to preserve indigenous languages via community-driven literacy applications. Affected countries: Australia. UNETE 2,100,000.00 23 2016 Education/digital content for people with limited connectivity https://www.google.org/our-work/education/ -- Grantee to increase access to digital educational content for students in Mexico with limited internet connectivity, through implementation of a new software platform, training and teacher support, and new devices. Affected countries: Mexico. Australian Indigenous Mentoring Experience 247,000.00 150 2015 Education/STEM education/Computer science education https://www.google.org/our-work/education/ -- Grant to raise awareness of STEM and CS pathways among indigenous students. Affected countries: Australia. Benetech: Bookshare 800,000.00 71 2015 Education/book distribution https://www.google.org/our-work/education/ -- Grant to expand the reach of Bookshare by expanding the availability of quality content and improve its functionality to improve content distribution. Bibliothèques Sans Frontières 217,440.00 159 2015 Education/refugee education https://www.google.org/our-work/education/ -- Grant for a toolkit-in-a-box approach to address social isolation of refugees and migrant populations. Affected countries: EMEA. British Computing Society 400,000.00 123 2015 Education/computer science education/online teacher training https://www.google.org/our-work/education/ -- Grant to create professional development in computational thinking and to provide in-person and online teacher training. Affected countries: United Kingdom. City Year San Jose/Silicon Valley 500,000.00 96 2015 Education/mentorship https://www.google.org/our-work/education/ -- Grant supports tutoring, mentoring, and STEM program for underserved youth in the Overfelt High School feeder schools in East San Jose. Affected countries: United States; affected states: California; affected cities: San Jose. Fundacion Ayuda en Accion 765,000.00 75 2015 Education/computer science education https://www.google.org/our-work/education/ -- Grant to provide in-depth, high-quality computer science education to 5,000 schoolchildren and 500 teachers in high-need schools. Affected countries: Spain. Kiron University 336,465.00 130 2015 Education https://www.google.org/our-work/education/ -- Grant to launch pilot projects and/or set up operations in Turkey and Jordan. Affected countries: Turkey|Jordan. Royal Belgian Institut of Natural Sciences 758,000.00 76 2015 Education/science education/technology-assisted education https://www.google.org/our-work/education/ -- Grant to distribute "infrared birdboxes" around the country of Belgium for a Raspberry Pi program. Affected countries: Belgium. NCWIT 500,000.00 96 2015 Education/computer science education https://www.google.org/our-work/education/ -- Fund to support the creation and expansion of women in computing support groups (WICs); build eco-systems of WICs and get them sharing best practices, mentoring other WICs etc. Affected countries: United States. Oakland Public Education Fund 750,000.00 77 2015 Education/college prep https://www.google.org/our-work/education/ -- Fund to pilot the KHEPERA Career Academy, a school-within-a-school model where African American 10th to 12th grade males will complete the full college preparatory course sequence that is tailored to their unique needs and interests. Affected countries: United States; affected states: California; affected cities: Oakland. Pro Juventute 800,000.00 71 2015 Education/digital skills https://www.google.org/our-work/education/ -- Grant to offer digital literacy workshops for 20000 Swiss schoolchildren annually and to develop an online digital drivers license. Affected countries: Switzerland. Raspberry Pi Foundation 400,000.00 123 2015 Education/computer science education/devices https://www.google.org/our-work/education/ -- Grant to scale up the Picademy teacher training program, to provide Raspberry Pi devices, and for other general operating support. Affected countries: United Kingdom. Roses in Concrete Community School 750,000.00 77 2015 Education/teacher training https://www.google.org/our-work/education/ -- Grant to launch the Roses in Concrete Community School in the San Francisco Bay Area and establish a model for community responsive teacher development that can be shared and scaled to transform teaching in vulnerable communities throughout the nation. Affected countries: United States; affected states: California; affected cities: San Francisco. Society of Hispanic Professional Engineers 300,000.00 131 2015 Education/computer science education https://www.google.org/our-work/education/ -- Grant for conducting a series of professional development and social engagement opportunities specifically designed for those in or wanting to enter computing fields. Affected countries: United States. Spark SF Public Schools 1,000,000.00 49 2015 Education https://www.google.org/our-work/education/ -- Grant to provide dedicated college affordability advising to the African American seniors in all SFUSD high schools through an innovative partnership with uAspire, a nonprofit that helps students find an affordable way to a postsecondary education. Affected countries: United States; affected states: California; affected cities: San Francisco. TalkingPoints 500,000.00 96 2015 Education https://www.google.org/our-work/education/ -- Grant for multilingual texting platform to increase teacher/parent engagement in low-income, immigrant communities. Affected countries: United States; affected states: California; affected cities: San Francisco. Technovation 435,000.00 120 2015 Education/computer science education https://www.google.org/our-work/education/ -- Grant to support scaling of Technovation Challenge: 12-week curriculum culminating in social impact mobile app development competition that is now global. The Big Lift 500,000.00 96 2015 Education https://www.google.org/our-work/education/ -- Grant for collective impact summer program focused on early literacy for Latino and African-American children in San Mateo. Affected countries: United States; affected states: California; affected cities: San Mateo. Oakland Digital 600,000.00 87 2015 Job training/digital skills https://www.google.org/our-work/economic-opportunity/oakland-digital/ -- Grantee has a BRIDGEGOOD hiring platform that pairs early stage creatives (designers, photographers, illustrators) with business owners and nonprofits that need design or markeing expertise. Google.org is helping with grant money, state-of-the-art technology devices, Googler developer volunteer hours, and a San Francisco coworking space. The donations are being used to design, build, launch and scale the BRIDGEGOOD platform in the San Francisco Bay Area. Affected countries: United States; affected states: California; affected cities: Oakland|San Francisco|Berkeley. WeTechCare 1,000,000.00 49 2015 Joba training/digital skills https://www.google.org/our-work/economic-opportunity/ -- Grant to provide digital skills training to 1M vulnerable and socially excluded people in France and help them access jobs and government benefits. Affected countries: France. First Place for Youth 500,000.00 96 2015 Housing, education and employment support https://www.google.org/our-work/economic-opportunity/ -- Grant to ensure that foster youth in Santa Clara County have the housing, education, and employment supports necessary to defy the odds and achieve self-sufficiency and stable housing. Affected countries: United States); affected states: California; affected cities: San Jose|Santa Clara|Sunnyvale|Palo Alto|Mountain View|Cupertino|Milpitas|Campbell|Los Gatos|Saratoga|Los Altos|Morgan Hill. GiveDirectly 2,000,000.00 24 2015 Cash transfers https://www.google.org/our-work/economic-opportunity/ -- Grant to expand cash transfer program in Rwanda. Affected countries: Rwanda. The Hidden Genius Project 250,000.00 139 2015 Tech skills and leadership training program https://www.google.org/our-work/economic-opportunity/ -- Grant supported a 15 month tech skills and leadership training program for black male high school students to transform their lives and communities. Affected countries: United States; affected states: California; affected cities: San Francisco. Infoxchange 247,000.00 150 2015 Digital exclusion https://www.google.org/our-work/economic-opportunity/ -- Grant to address digital exclusion with a focus on social housing. Affected countries: Australia. InnVision Shelter Network/Life Moves 750,000.00 77 2015 Homeless assistance https://www.google.org/our-work/economic-opportunity/ -- Grant to improve the long-term success of formerly homeless individuals and families by extending case management and encouraging successful habits through the use of an innovative SMS/text–based mobile technology platform. Affected countries: United States; affected states: California; affected cities: San Francisco. Jewish Vocational Service 500,000.00 96 2015 Career counseling https://www.google.org/our-work/economic-opportunity/ -- Grant to bridge the gulf between high school and independent adulthood by providing SFUSD students connections to career exploration, post-secondary training and career onramps. Affected countries: United States; affected states: California; affected cities: San Francisco. Kiva Microfunds 500,000.00 96 2015 Financing/Crowdfunding https://www.google.org/our-work/economic-opportunity/ -- Grant backing a hyper-local crowdfunding platform that provides 0% interest loans to small business entrepreneurs in Oakland. Affected countries: United States; affected states: California; affected cities: Oakland. Sodate-Age Net 205,000.00 162 2015 Education/digital skills https://www.google.org/our-work/economic-opportunity/ -- Grant for digital skills training for disadvantaged youth. Affected countries: Japan. Tipping Point/Year Up 500,000.00 96 2015 Education https://www.google.org/our-work/economic-opportunity/ -- Grant for closing the opportunity divide for disconnected young adults by designing a blended digital and in-person learning platform that enables Year Up to scale through community partners to reach 100x the number of current young adults directly served by the program. Affected countries: United States; affected states: California; affected cities: San Francisco. Y Generation Education 543,650.00 94 2015 Job training https://www.google.org/our-work/economic-opportunity/ -- Grant for online vocational education training and financing model to provide job skills for at-risk youth. Affected countries: France. Association My Human Kit 543,650.00 94 2015 Disability assistance https://www.google.org/our-work/inclusion/ -- Grant for 3D printed prosthetics R&D and a physical fablab dedicated to disabilities. Affected countries: France. Association of Parents and Friends of Exceptional Children of Rio Negrinho 150,000.00 170 2015 Disability assistance https://www.google.org/our-work/inclusion/ -- Grant to develop SpecialSMS, a program that incorporates curriculum on topics such as cognitive stimulation, confidence building, and inclusion training into a short message service platform that aims to reduce social stigma and marginalization and encourage independence of the Users. Affected countries: Brazil; affected states: Santa Catarina; affected cities: Rio Negrinho. Bayview Hunters Point Community Legal 217,440.00 159 2015 Legal representation/hunter community https://www.google.org/our-work/inclusion/ -- Grant for universal access to comprehensive legal representation for Bayview/Hunters Point communities. Affected countries: United States; affected states: California; affected cities: San Francisco. Beit Issie Shapiro 700,000.00 83 2015 Making https://www.google.org/our-work/inclusion/ -- Grant to develop "Makeathon-in-a-Box" and an Open Making Marketplace, in collaboration with Tikkun Olam Makers (TOM). Beit Issie Shapiro 1,000,000.00 49 2015 Disability assistance https://www.google.org/our-work/inclusion/ -- Grant to support distribution of Sesame Solution, a kit that enables a mobile phone to be fully operated with just user hand motions and voice control using a dongle which controls the phone. Affected countries: Israel. DAISY Consortium 900,000.00 68 2015 Disability assistance https://www.google.org/our-work/inclusion/ -- Grant to make content accessible to the visually-impaired by designing an Accessibility Baseline standard, updating content, and updating consumer-facing tools. Dan Marino Foundation 820,464.00 70 2015 Job training https://www.google.org/our-work/inclusion/ -- Grant to add functionality to VITA, its avatar-based job training aid, to better allow autism service providers to coach Users on job interview and preparedness skills. Affected countries: United States. Ella Baker Center 1,100,000.00 47 2015 Criminal justice reform/United States https://www.google.org/our-work/inclusion/ -- Grant for funding a restorative justice hub for Oakland young adults with Community Works West, a tech-forward, grassroots solution to end police violence against people of color, launch the Restore Oakland Center as a multi-use space for restorative justice and restorative economics. Affected countries: United States; affected states: California; affected cities: Oakland. Ezer Mzion Inc. 400,000.00 123 2015 Disability assistance https://www.google.org/our-work/inclusion/ -- Grant to contract Click2Speak LLC to develop improvements to its on-screen keyboard with appropriate patients, gather user feedback and feature requests, and improve the core technology, which has the potential for improving the speed and accuracy with which ‘locked-in’ individuals can communicate efficiently, which is critical for maintaining personal relationships and professional productivity. Fab Foundation: Enable Community Foundation 600,000.00 87 2015 Disability assistance/3D printing https://www.google.org/our-work/inclusion/ -- Grant to support the Enable Community Foundation to build on existing work delivering low-cost 3D printed hands to children and others via the community with which it works (e-NABLE Community); imrpove designs, delivery efficency, and partnerships. Inclusion Without Border Corp 550,000.00 92 2015 Disability assistance/smart augmentative and alternative communication software https://www.google.org/our-work/inclusion/ -- Grant to develop the first-ever smart augmentative and alternative communication software capable of adapting to multiple signals in the user’s environment. Miraclefeet 1,000,000.00 49 2015 Disability assistance/prosthetics https://www.google.org/our-work/inclusion/ -- Grant to design an integrated software platform for individuals with Clubfoot that enhances Patient care and accelerates rate of treatment in new geographies. Mission ARM Japan 205,000.00 162 2015 Disability assistance/prosthetics/3D printing https://www.google.org/our-work/inclusion/ -- Grant for low-cost 3D printed prosthetic limbs for people with disabilities. Affected countries: Japan. Neil Squire Society 800,000.00 71 2015 Disability assistance/mouth-controlled assistive device https://www.google.org/our-work/inclusion/ -- Grant to develop a mobile-friendly, mouth-controlled input controller that can be locally produced and to test a new, cost-effective model to get assistive technology out to those who need it, resulting in more than 1,500 LipSync devices produced and 50 institutions engaged in local manufacturing of LipSync. Nia Technologies 400,000.00 123 2015 Disability assistance/prosthetics/3D printing https://www.google.org/our-work/inclusion/ -- Grant to expand 3D PrintAbility beyond its initial pilot at the CoRSU Rehabilitation Hospital in Uganda, by serving more people and training more prostheticians in use of their SocketMixer software and hardware solution. Patients Association for Distal Myopathies 410,000.00 121 2015 Disability assistance/crowdsourced accessibility map https://www.google.org/our-work/inclusion/ -- Grant for crowdsourced accessibility map for Japan. Affected countries: Japan. Perkins School for the Blind 750,000.00 77 2015 Disability assistance/micronavigation platform https://www.google.org/our-work/inclusion/ -- Grant to develop "crowdsourcer" and "navigator" components for its micronavigation platform, incluidng user research and testing. Affected countries: United States; affected states: Massachusetts; affected cities: Watertown. ProPortion Foundation 1,000,000.00 49 2015 Disability assistance/prosthetics https://www.google.org/our-work/inclusion/ -- Grant to improve delivery of lower limb prosthetic sockets in Colombia through ongoing development and distribution of a new product (“Majicast”) that enables both more efficient socket creation and a better fit. Affected countries: Colombia. Rainbow Colored Diversity 205,000.00 162 2015 Tolerance education https://www.google.org/our-work/inclusion/ -- Grant for digital outreach campaign to build tolerance for sexual minorities. Affected countries: Japan. Ratna Nidhi Charitable Trust 350,000.00 128 2015 Disability assistance/prosthetics https://www.google.org/our-work/inclusion/ -- Grant to improve delivery of lower limb prosthetic sockets in remote and underserved parts of India through development and distribution of a new product (“Product”) that enables both more efficient socket creation and a better fit. Affected countries: India. Royal London Society for Blind People 1,000,000.00 49 2015 Disability assistance/blindness https://www.google.org/our-work/inclusion/ -- Grant to expand beacon-based Wayfindr app by developing three key components. Affected countries: United Kingdom. Silicon Valley De-Bug 600,000.00 87 2015 Participatory defense https://www.google.org/our-work/inclusion/ -- Grant to significantly scale Participatory Defense -- a new organizing methodology that empowers people facing charges, their families, and their communities to impact the outcome of cases and change the landscape of power in the criminal justice system. Affected countries: United States; affected states: California; affected cities: San Francisco. Sozialhelden e.V. 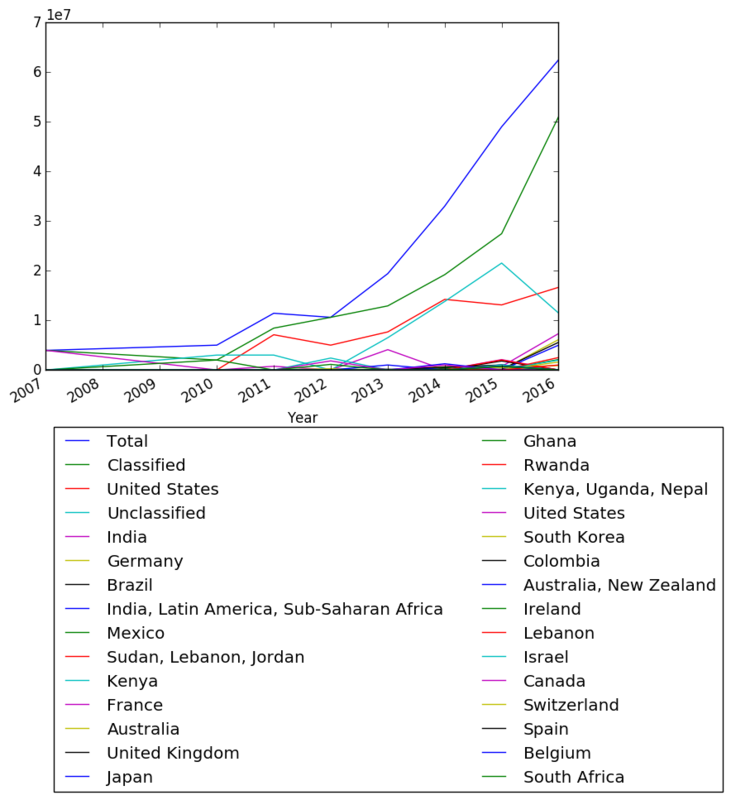 911,378.00 67 2015 Disability assistance https://www.google.org/our-work/inclusion/ -- Grant to lead the establishment of a shared data ecosystem for information about physical accessibility of points of interest around the world. Telecommunications for the Deaf and Hard of Hearing 500,000.00 96 2015 Disability assistance/hearing assistance https://www.google.org/our-work/inclusion/ -- Grant to bring software product that uses speech-to-text technology to automatically generate a live captions feed that can be corrected by designated event participants to Android and iOS. 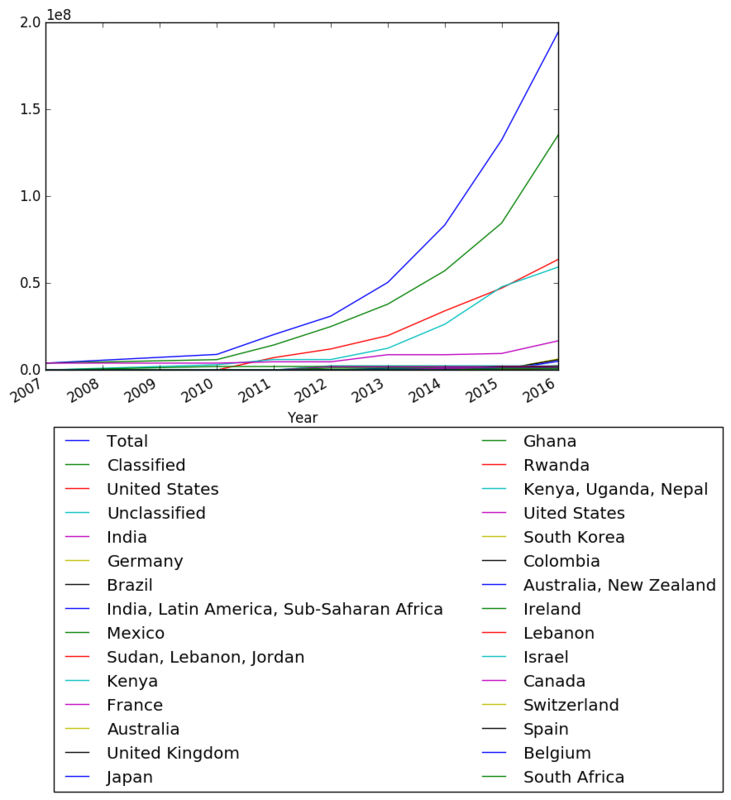 The Arc of the United States 1,400,000.00 38 2015 Disability assistance https://www.google.org/our-work/inclusion/ -- Grant to adapt Tech Toolbox into a search and data analytics platform to enable users to edntify technology aids and clinical interventions to help them reach their goals. The Center for Discovery 1,125,000.00 45 2015 Disability assistance/wheelchair https://www.google.org/our-work/inclusion/ -- Grant to advance the development of its existing power wheelchair add on (“Easy Drive”) from a rough prototype to a beta product ready for a 1,000-unit production run (the “Product”), and establish a marketing and partnership strategy that will help bring the Product to scale. Essie Justice Group 250,000.00 139 2015 Criminal justice reform/United States https://www.google.org/our-work/inclusion/ -- Grant for advocacy and support network for women with incarcerated loved ones to transform public attitudes and policies around criminal justice. Affected countries: United States; affected states: California; affected cities: San Francisco. The Leprosy Mission Trust 350,000.00 128 2015 Disability assistance/leprosy/footwear https://www.google.org/our-work/inclusion/ -- Grant to create high-fidelity, customized, cost-competitive footwear for people with leprosy using 3D scanning and printing technology. Affected countries: India. The Motivation Charitable Trust 765,207.00 74 2015 Disability assistance/3D printing/wheelchairs https://www.google.org/our-work/inclusion/ -- Grant to develop and test a model for using 3D printing to create customized postural support devices (“PSDs”) that enable wheelchair users to fit comfortably and appropriately into their chairs. The Reset Foundation 250,000.00 139 2015 Criminal justice reform/alternatives to prison/United States https://www.google.org/our-work/inclusion/ -- Grant for a 24/7 supportive campus as an alternative to prison for sentenced young men of color. Affected countries: United States; affected states: California; affected cities: San Francisco. UCP Wheels for Humanity 999,995.00 66 2015 Disability assistance/wheelchairs https://www.google.org/our-work/inclusion/ -- Grant to lead an effort to use data to improve the variety, volume, and quality of wheelchairs available to people with disabilities in low resource countries. University of Washington 717,728.00 82 2015 Disabiliy assistance/information about location and availability of assistive technology https://www.google.org/our-work/inclusion/ -- Grant to lead a partnership between its Center for Technology and Disability Studies, the Southern Africa Federation of the Disabled (SAFOD), and the African Network for Evidence-to-Action on Disability (AfriNEAD) to improve people with disabilities’ access to information about the location and availability of assistive technology in Sub-Saharan Africa. Affected countries: South Africa. World Wide Hearing 550,000.00 92 2015 Disability assistance/deafness/hearing screenings https://www.google.org/our-work/inclusion/ -- Grant for designing an ipad based audiometer to more scalably conduct hearing screenings in the developing world. NetHope 5,700,000.00 3 2015 Crisis response/Refugee support/Internet access https://www.google.org/our-work/crisis-response/nethope/ -- $900,000 grant to NetHope addressed connectivity issues frequently experienced by refugees. NetHope installed low-cost WiFi and charging stations along migration routes in the Balkan Region. Under Google.org’s Disaster Corps program, Google volunteers joined Cisco volunteers to help NetHope install 75 hotspots within refugee camps and transit centers, giving over 500,000 inhabitants access to the internet. Similarly, a second grant of $5.3 million allowed NetHope to purchase and distribute 25,000 Chromebooks to nonprofits working with refugees in Germany. The devices let the organizations distribute informational content and tailor programming to fit specific user needs like children’s education or job opportunities. International Rescue Committee 2,000,000.00 24 2015 Crisis response/Refugee information https://www.google.org/our-work/crisis-response/irc-refugee-crisis/ -- Google volunteers worked with the International Rescue Committee and Mercy Corps to launch a “Crisis Info Hub” for refugees. The hub provided critical information about safe movement, legal rights, and trustworthy services in Greece and the Balkans. Now called Refugee.Info, the platform aggregates and publishes location-based information about rights and services available to refugees and asylum seekers. Refugee.Info is live in Greece and Serbia and will soon expand to more countries in the Balkans, the Central Mediterranean, and the Middle East. Khan Academy 1,000,000.00 49 2015 Education/online video education https://www.google.org/our-work/education/ -- Grant supports continued operation and growth of recipient, specifically investments in intelligent software, deep data analytics, and intuitive user interfaces. See https://www.google.org/our-work/education/khan-academy/ for more. Code.org 1,000,000.00 49 2015 Education/online coding education https://www.google.org/our-work/education/ -- Funding is to facilitate Code.org partnerships with teachers and school districts to promote the study of computer science. Although Code.org is globally accessible, the partnerships are in the United States. Google.org supports Code.org in many ways. For instance, the Google visual coding language, Blockly, underpins the Code.org educational content. Googlers also volunteer for in-person activities and provide project management skills. See https://www.google.org/our-work/education/code-org/ for more. Affected countries: United States. 826 Valencia 217,440.00 159 2015 Education/community-based creative writing https://www.google.org/our-work/education/ -- Grant for a community-based creative writing center in a renovated liquor store in the Tenderloin. Affected countries: United States; affected states: California; affected cities: San Francisco. Actua 1,000,000.00 49 2014 Education/computer science education https://www.google.org/our-work/education/ -- Grant for offering CS education workshops and training for 100k+ kids in Canada. Affected countries: Canada. Alannah and Madeline Foundation 1,250,000.00 40 2014 Education/digital skills https://www.google.org/our-work/education/ -- Grant to provide a digital drivers license to 300,000 kids in Australia, and expand the program to New Zealand. Affected countries: Australia|New Zealand. Australian Indigenous Mentoring Experience 438,775.00 119 2014 Education/STEM education https://www.google.org/our-work/education/ -- Grant for online game to inspire young Indigenous students to learn maths and science. Affected countries: Australia. Beyond 12 3,000,000.00 14 2014 Education/college prep https://www.google.org/our-work/education/ -- Grant to develop the next generation of MyCoach, a mobile app that helps low-income students navigate the path to college and stay on track once they arrive, significantly enhancing graduation rates. Follow-on grant expands the app with programming and support to transition to college. DonorsChoose.org 8,500,000.00 1 2014 Education/tech projects https://www.google.org/our-work/education/ -- Grant provides support for tech projects posted by teachers in several cities across the U.S. Affected countries: United States. Level Playing Field Institute 1,050,000.00 48 2014 Education/computer science education https://www.google.org/our-work/education/ -- Grant to bring CS education into schools nationwide (in the United States) by influencing states where CS does not qualify for math/science credit and engaging 300,000 kids in an ‘Hour of Code’ during CS EdWeek. Affected countries: United States. Literacy Lab (Bring Me a Book) 500,000.00 96 2014 Education/earliy childhood literacy https://www.google.org/our-work/education/ -- Grant for supporting early childhood literacy through books and online community. Affected countries: United States; affected states: California; affected cities: San Francisco. Mural Music and Arts Project 100,000.00 171 2014 Education https://www.google.org/our-work/education/ -- Grant for STEAM education through hip hop videos. University of New South Wales (ASPIRE) 219,387.00 158 2014 Education/devices/Raspberry Pi https://www.google.org/our-work/education/ -- Grant for online educational and career development platform for disadvantaged students. Affected countries: Australia. Colnodo 600,000.00 87 2014 Job training/digital skills https://www.google.org/our-work/economic-opportunity/colnodo/ -- Grantee works to train unemployed urban youth and rural populations in digital skills to prepare them for technolog sector jobs. Affected countries: Colombia. BUILD 250,000.00 139 2014 Entrepreneurship https://www.google.org/our-work/economic-opportunity/ -- Grant for empowering high school kids through entrepreneurship. Center for Employment Opportunities 500,000.00 96 2014 Job training https://www.google.org/our-work/economic-opportunity/ -- Grant for providing jobs and support for formerly incarcerated people. Affected countries: United States; affected states: California; affected cities: San Francisco. Comunidad IT (Associación Civil Comunidad IT de fromacion e insercian laboral) 300,000.00 131 2014 Job training https://www.google.org/our-work/economic-opportunity/ -- Grant for providing job-ready coding skills for young people in Argentina. Affected countries: Argentina. Family Independence Initiative 400,000.00 123 2014 Family support https://www.google.org/our-work/economic-opportunity/ -- Grant to restore economic mobility to America’s low-income communities by providing a flexible marketplace of financial resources conditioned upon families self-organizing in community groups to determine their own strategies for improving their lives and rigorously reporting their progress towards goals. Affected countries: United States; affected states: California; affected cities: San Francisco. Fondazione Mondo Digitale 500,000.00 96 2014 Job training/digital skills https://www.google.org/our-work/economic-opportunity/ -- Grantee opened a maker space and studio to train young people in digital job readiness skills. Affected countries: Italy. Fundacion Crea (Crea Comunidades de Emprendedores Sociales AC) 443,000.00 118 2014 Entrrepeneurship/digital skills https://www.google.org/our-work/economic-opportunity/ -- Grant for offering basic digital and web skills for women microentrepreneurs. Affected countries: Mexico. GiveDirectly 2,000,000.00 24 2014 Cash transfers/evidence base https://www.google.org/our-work/economic-opportunity/ -- Grant to provide evidence to inform governments, funders, and NGOs about how unconditional cash transfers impact the local economy, in order to promote widespread adoption among governments. Hack the Hood 500,000.00 96 2014 Job training/technology https://www.google.org/our-work/economic-opportunity/ -- Grant for jumpstarting tech careers for low-income youth. Affected countries: United States; affected states: California; affected cities: San Francisco. HandUp 500,000.00 96 2014 Cash transfers https://www.google.org/our-work/economic-opportunity/ -- Grant to help both homeless and low-income individuals/families overcome poverty by leveraging a charitable giving technology platform that connects donors with neighbors who are struggling to meet their basic needs. Affected countries: United States; affected states: California; affected cities: San Francisco. Instituto Socioambental 222,990.00 157 2014 Sustainability/Amazon https://www.google.org/our-work/economic-opportunity/ -- Grant for creating open source mini-mills used to produce forest products and generate sustainability in the Amazon (note that this description was in Portugese and the Google.org description writer put it through google translate so it may not make much sense). Affected countries: Brazil. JobTrain 675,000.00 85 2014 Job opportunity/cafe and catering business https://www.google.org/our-work/economic-opportunity/ -- Grantee to provide the first rung on the job ladder for people with multiple barriers to employment through launching Rendezvous Café & Catering, a new social enterprise in Redwood City providing livable wage jobs and career paths to people who have been excluded from the workforce. Affected countries: United States; affected states: California; affected cities: Redwood City. Mission Asset Fund 250,000.00 139 2014 Financing/credit opportunities https://www.google.org/our-work/economic-opportunity/ -- Grant for expanding credit opportunities for hardworking families. Affected countries: United States. Center for Youth Wellness 3,000,000.00 14 2014 Adverse childhood experiences https://www.google.org/our-work/inclusion/ -- Grant to mitigate the negative effects of adverse childhood experiences (“ACEs”) on brain development during childhood and shift awareness and practices in pediatric care through the development of a nationally scalable clinical approach. Defy Ventures 1,250,000.00 40 2014 Job search/affordable housing/business training https://www.google.org/our-work/inclusion/ -- Grant to provide devices to 350 Defy program participants to efficiently manage their job search, find affordable housing, research their business ideas, and participate in online training. Affected countries: United States; affected states: California; affected cities: San Francisco. Ella Baker Center for Human Rights 100,000.00 171 2014 Criminal justice reform/United States/restorative justice https://www.google.org/our-work/inclusion/ -- Grant for restorative justice hub for Oakland young adults with Community Works West. Affected countries: United States; affected states: California; affected cities: Oakland. Royal National Institute of Blind People 850,300.00 69 2014 Disability assistance/blindness/sight loss https://www.google.org/our-work/inclusion/ -- Grant for smart glasses to improve life for people with sight loss. Toolworks, Inc 100,000.00 171 2014 Job search/disability assistance https://www.google.org/our-work/inclusion/ -- Grant for employment opportunitities for people with disabilities. Médecins Sans Frontières 2,500,000.00 19 2014 Global health/crisis response/Ebola https://www.google.org/our-work/crisis-response/msf-ebola/ -- Supported through funding from Google.org, MSF mobilized thousands of staff to support immediate relief efforts, trained nearly 600 first responders and thousands of West African health staff in patient care, safety precautions, and safe burials. At the height of the outbreak, MSF operated 650 beds in isolation and had 4,475 staff on the ground providing care to 10,200+ people. Upon seeing how difficult it was to track patients’ medical information during the Ebola outbreak, Google engineers also contributed to the development of products that could help doctors better manage and organize patient records while working in the field. The first of these efforts was dubbed Project Buendia - an open source medical system app with a simple UI that could be navigated by doctors in full protective gear to eliminate the need for paper records. Later, Google engineers also developed a prototype for a waterproof, sterilizable tablet that was covered in polycarbonate and can be dipped in chlorine disinfectant. Khan Academy 2,000,000.00 24 2014 Education/online video education https://www.google.org/our-work/education/ -- Grant supports continued operation and growth of recipient, specifically investments in intelligent software, deep data analytics, and intuitive user interfaces. Separate grant of this amount. See https://www.google.org/our-work/education/khan-academy/ for more. CANVAS 1,000,000.00 49 2013 Education/computer science education https://www.google.org/our-work/education/ -- Grant for bringing programming education throughout Japan, providing Raspberry Pis to schools and wraparound training and support to teachers. Affected countries: Japan. Codeacademy/DonorsChoose/Khan Academy 1,000,000.00 49 2013 Education/computer science education https://www.google.org/our-work/education/ -- Grant to support independent learning paths for girls without school or club access to CS. Provide teacher incentives (via DonorsChoose.org) for providing time and encouragement. Affected countries: United States. Girls Who Code 20,000.00 177 2013 Education/computer science education https://www.google.org/our-work/education/ -- Grant to expand Girls Who Code club model to 100 clubs serving 1500 girls. Affected countries: United States. Going to School Fund 241,057.00 152 2013 Education/entrepreneurship https://www.google.org/our-work/education/ -- Grant for open source mobile games that teach critical entrepreneurship skills to Indian children. Affected countries: India. Institute for Veterans and Military Families 406,000.00 122 2013 Education/veterans education https://www.google.org/our-work/education/ -- Grant for first-ever comprehensive nationwide analysis of veterans education. Affected countries: United States. NCWIT 1,500,000.00 33 2013 Education/computer science education https://www.google.org/our-work/education/ -- Grant to expand NCWIT Extension Services program from 30 to 60 schools, actively working to double female CS degrees in 5 years. Affected countries: United States. Posse Foundation 241,057.00 152 2013 Education/veterans education https://www.google.org/our-work/education/ -- Grant for first-ever comprehensive nationwide analysis of veterans education. Affected countries: United States. Student Veterans Association 1,500,000.00 33 2013 Education/veterans education https://www.google.org/our-work/education/ -- Grant for first-ever comprehensive nationwide analysis of veterans education. Affected countries: United States. Kiva Labs 3,000,000.00 14 2013 Financing/Crowdfunding https://www.google.org/our-work/economic-opportunity/ -- Grant to combine the power of crowdfunding and microfinance to accelerate solutions tailored to people’s unique needs. MAKLab 151,160.00 167 2013 Job training/digital manufacturing skills https://www.google.org/our-work/economic-opportunity/ -- Grant for workshop giving young entrepreneurs access to digital manufacturing skills. Affected countries: United Kingdom. Samasource 2,000,000.00 24 2013 Hiring https://www.google.org/our-work/economic-opportunity/ -- Grant for developing tools based on successful grantee model for hiring new tech workers from poor populations. vInspired 151,160.00 167 2013 Hiring https://www.google.org/our-work/economic-opportunity/ -- Grant for digital platform facilitating the search for short term employment opportunities. Amnesty International 151,160.00 167 2013 Human rights https://www.google.org/our-work/inclusion/ -- Grant for mobile alert system for activists at risk of unlawful detainment, disappearance and torture. Geena Davis Institute 1,200,000.00 44 2013 Gender representation https://www.google.org/our-work/inclusion/ -- Grant for development of new voice/image recognition software to analyze gender portrayals in film. Code.org 3,000,000.00 14 2013 Education/online coding education https://www.google.org/our-work/education/ -- Funding is to facilitate Code.org partnerships with teachers and school districts to promote the study of computer science. Although Code.org is globally accessible, the partnerships are in the United States. Google.org supports Code.org in many ways. For instance, the Google visual coding language, Blockly, underpins the Code.org educational content. Googlers also volunteer for in-person activities and provide project management skills. See https://www.google.org/our-work/education/code-org/ for more. Affected countries: United States. Pratham 3,850,000.00 11 2013 Education/open-source platform for book translation https://www.google.org/our-work/education/storyweaver/ -- Grant supports StoryWeaver, an online platfor that connecs readers, authors, illustrators, and translators. Open-sourced stories are translated to up to 60 languages and therefore become accessible to people in different regions. Translated content can be downloaded, accessed on multiple devices, and printed. Affected countries: India. GiveDirectly 2,400,000.00 22 2012-12 Cash transfers https://www.theatlantic.com/business/archive/2012/12/can-4-economists-build-the-most-economically-efficient-charity-ever/266510/ -- Grantee page is at https://www.google.org/our-work/economic-opportunity/give-directly/ and explains reasons for Google being excited about the Good Ventures approach of unconditional cash transfers. Affected countries: Kenya. DonorsChoose.org 5,000,000.00 5 2012 Education/STEM education/teacher incentives https://www.google.org/our-work/education/ -- Grant to engage disadvantaged students in STEM by providing start-up funding for new AP STEM courses and rewarding successful teachers. Incentivize enrollment that reflects school diversity. Affected countries: United States. Equal Opportunity Schools 1,830,000.00 32 2012 Education/AP courses https://www.google.org/our-work/education/ -- Grant to demonstrate that moving disadvantaged students into rigorous AP courses is the most efficient educational intervention to improve college graduation rates; data analysis to identify minority students who should be in AP courses. Affected countries: Uited States. Fraunhofer-Gesellschaft Open Roberta 253,000.00 138 2012 Education/computer science education https://www.google.org/our-work/education/ -- Grant to build an open-source platform to provide teachers with the tools and curriculum needed to instruct children in robotics. Affected countries: Germany. Trinity Foundation Ireland 1,124,770.00 46 2012 Education/computer science education https://www.google.org/our-work/education/ -- Grant to help transform computer science education in Irish schools through teacher training programs and improvements in computer science and STEM capacity, providing training to 1,000 teachers and sponsoring the introduction of Teach First in Ireland. Affected countries: Ireland. African Leadership Academy 500,000.00 96 2011 Education/technology education https://www.google.org/our-work/education/ -- Grant to develop high-impact young African women leaders who can apply their passion for technology and science to develop innovations that can enable Africa to ‘leap-frog’ development in critical areas like energy, education, agriculture, infrastructure, and healthcare. Affected countries: Africa. Citizen Schools 3,250,000.00 13 2011 Education/STEM education https://www.google.org/our-work/education/ -- Grant to launch, operate, and evaluate Expanded Learning Time partnerships with high-need schools across its network and mobilize volunteer Citizen Teachers to bring learning to life, especially in STEM subjects. Affected countries: United States. Concord Consortium 2,500,000.00 19 2011 Education/computer science education https://www.google.org/our-work/education/ -- Grant to use HTML5 and browser technologies to make STEM educational models and simulations accessible to a much larger group of users and to lay the foundation for wider integration and expanded technology-based educational curriculum delivery. Affected countries: United States. Generating Genius 76,484.00 176 2011 Education/computer science education https://www.google.org/our-work/education/ -- Grant to use a coding model to engage children from disadvantaged backgrounds into STEM. Affected countries: United Kingdom. Girlstart 100,000.00 171 2011 Education/computer science education https://www.google.org/our-work/education/ -- Affected countries: United States; affected states: California. Magic Bus India 750,000.00 77 2011 Education https://www.google.org/our-work/education/ -- Grant to digitize the Magic Bus Curriculum and expand it to Bihar. Affected countries: India; affected states: Bihar. Teach For All 2,000,000.00 24 2011 Education https://www.google.org/our-work/education/ -- Grant to support growth of the Teach for All global network that provides assistance to aspiring early stage entrepreneurs who want to adapt Teach For All’s model to address educational need in their countries; delivers technical assistance to increase and accelerate partners’ impact; and creates a global community of leaders committed to learning from one another to end educational inequity. Samasource 1,250,000.00 40 2011 Hiring https://www.google.org/our-work/economic-opportunity/ -- With grant, grantee grew and sustained an engineering team that enabled us to accommodate more sales clients and data services, resulting in an accelerated pace of impact to our beneficiaries. Affected countries: United States; affected states: California; affected cities: San Francisco. CAMFED International 2,000,000.00 24 2010 Education https://www.google.org/our-work/education/ -- Grant to establish three ICT centers in northern Ghana managed by young women to serve their local communities with an emphasis on providing subsidized services and training to local secondary students and members of the Camfed alumni network. Affected countries: Ghana. Khan Academy 3,000,000.00 14 2010 Education/online video education https://www.google.org/our-work/education/khan-academy/ -- Grant supports continued operation and growth of recipient, specifically investments in intelligent software, deep data analytics, and intuitive user interfaces. The grant amount listed here subtracts separately listed grants at https://www.google.org/our-work/education/ (More education grantees section). Pratham 3,950,000.00 10 2007 Education/assessment https://www.google.org/our-work/education/pratham/ -- The $4 million from Google.org since 2007 helped fund the ASER (Annual Status of Education Report) Centre, that conducts surveys to assess the level of literacy or numeracy of children in rural India. Finding: although 96% of children are enrolled in school, about half cannot read a simple text or do arithmetic. Affected countries: India.